Our next Ambrell PRO SkillsTM Webinar will be held on March 15th at 2:00 pm EDT. Induction heating applications guru Dr. Girish Dahake, Ambrell’s Senior Vice President, Global Applications, will host the session and it'll cover Induction Heating Fundamentals. The webinar will review sources of heat, induction theory, coupling of the work piece, frequency of operation, power calculations and simulation problems. Practical examples from Dr. Dahake's extensive experience will be provided throughout the course. The session will be interactive; participants will be encouraged to ask questions. The course is ideal for anyone thinking about using induction, or someone who is but would like to learn more theory. Dr. Dahake has over 20 years of induction experience and leads a worldwide team of induction experts at three applications laboratories – in the United States, Netherlands, and United Kingdom – which many in the industry know as THE LAB. He holds patents, has authored numerous papers and frequently presents at professional conferences. He holds a Ph.D. in Mechanical and Aerospace Engineering from the University of Rochester. To register for the session, visit the PRO Skills Webinar session page. Information about additional webinars in the series can be found on our website, and those webinars are scheduled one-on-one as requested. 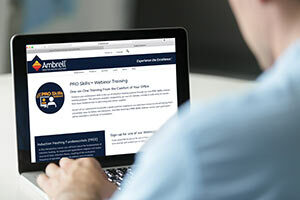 To learn more about Ambrell and the PRO Skills Webinar series, visit www.ambrell.com or call +1 585-889-9000.